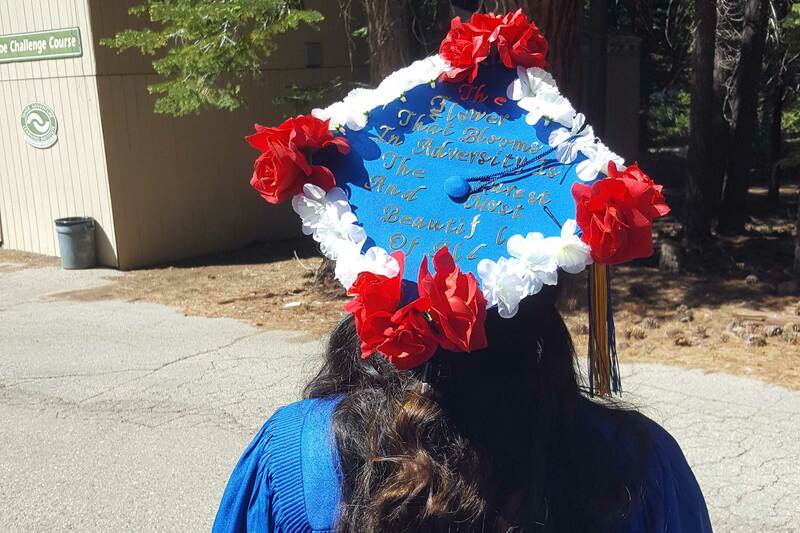 A member of a mixed status family, Raquel Bravo graduates from South Tahoe High School on June 8, 2018, without the presence of her parents. Courtesy of Raquel Bravo. When I was 10 years old, I didn’t know what “undocumented” was. All I knew was that it was a word that existed. 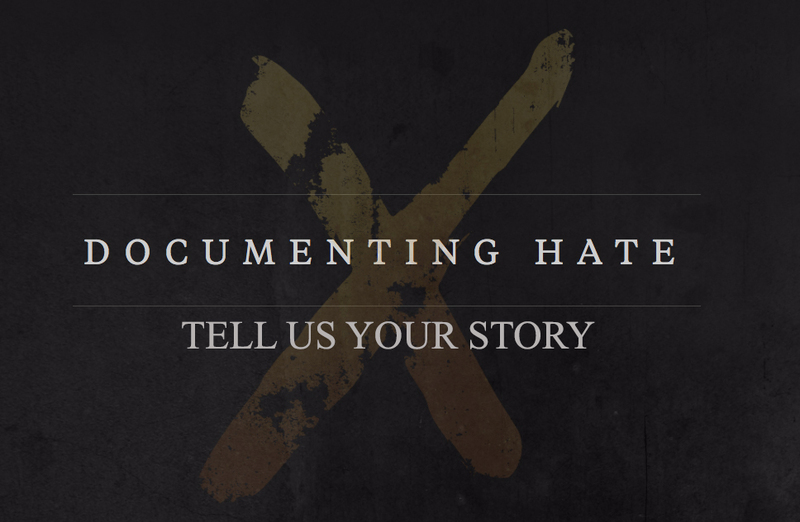 “Undocumented” and “illegal” were words that I never heard until my parents told me and my sister that we were moving to Mexico. My mom explained that her dad, who I had only spoken with twice in my life, was getting old. Understandably, she wanted to be there with him before he died. My mom wanted to repair the relationship between her and her dad, and she wanted us to have a relationship with him as well. My grandpa was in Mexico, and I was in the United States. I didn’t understand why my mom couldn’t visit him, but we could often visit my dad’s mother in Orange County, California. It was at that moment that my mom explained to me what the words “undocumented” and “illegal” meant. I learned that I was the only one in our family who had papers, or was a “ legal citizen,” and that my parents and older sister did not have papers and were “illegal.” She revealed that, if we left the country, the three of them wouldn’t be able to come back. As we sat together on my parents’ bed, my perfect little world crumbled in an instant. While I was trying to understand what these words meant, my parents made it clear that we were moving to Mexico. Five weeks passed in an instant and the next thing I knew, I was standing in the living room of our now empty apartment, confused and scared. My sister was born in Mexico and came to the United States when she was eight months old. This was the only country she knew. This is where she learned how to walk, to ride a bike, to swim and to draw (her favorite hobby). It also would have been the place where she first had a boyfriend, and her first kiss, but that experience would be ripped away from her. Standing in the living room that day, I saw my sister cry as she said goodbye to the only friends she had ever known. My dad, ever stoic, packed our belongings in a U-haul. It was then that I wished my mom was lying about never being able to return to the U.S. I had been told a great secret that would define the rest of my life. And once I was on the plane, looking out the window, I knew this was real, and I also knew that wishing wouldn’t change anything. Sadly I eventually came to learn that I was one of nine million people who are a part of what have been labeled as “mixed status” families. 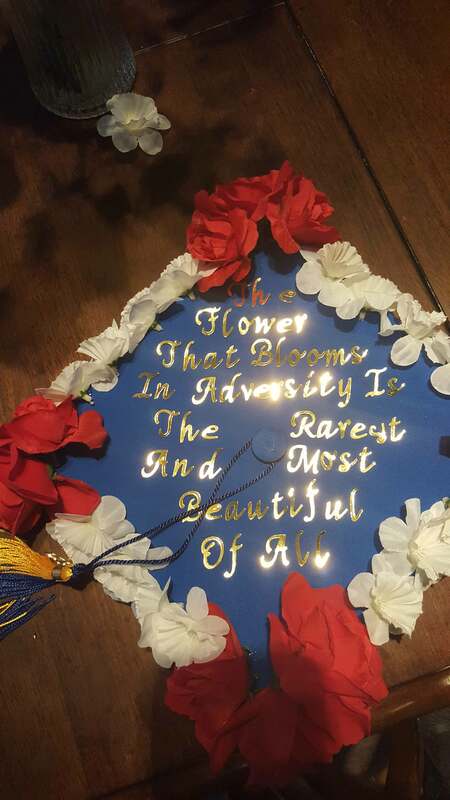 Raquel Bravo’s graduation cap reads: “The flower that blooms in adversity is the rarest and most beautiful of all.” Courtesy of Raquel Bravo. As the airplane started to get closer to the terminal in Guadalajara, Mexico, I tried to fill my head with happy thoughts. I was about to meet many family members whom I had never met, but I’d finally be able to see the place where my parents’ story began. When my sister was eight months old, my parents, who weren’t married at the time, chose to visit the United States. The visit turned into a permanent stay when I was born. I later found out that my parents stayed in the United States just because of me and that they had been wanting to live in Mexico. Now, just like my parents, I had high expectations of this place called Mexico that was going to be my new permanent home. Some people in America might argue that Mexico was supposed to be my home all along, but it wasn’t. For once though, I understood how my parents felt when they left their first home: like an outsider. Before being uprooted from my small hometown, I thought my family and I lived in a perfect little bubble. My dad worked a regular nine-five office job, while my mom worked at my elementary school. My older sister and I were very different. She was a introverted teenager that would stay in her room either doodling or reading while I was an energetic kid that could not stay quiet to save my life. We shared a room for my entire life, which caused us to fight often, we still loved each other very much. We lived in a small two bedroom, one bathroom apartment with a big television in our perfectly sized living room right next to my dad’s little work space. I remember waking up at dawn to the light of the living room being visible from the bottom of the door to my room and to the sound of tapping of my dad’s keyboard. I would get out of bed and take a blanket so I could sleep on the couch and be with my dad. That was one of the rare occasions I would wake up early in the morning. When my mom would talk about her small town, she made it sound like this town out of a dream. She talked of a place where she spent most of her time playing outside; she would tell me of the memories she had of playing basketball and volleyball, swimming in the river on the special days, and of a lake where my dad took her for their first date. As we entered the small town, I was shocked by the realty that this once vibrant town had lost some of its color as we made our way to my abuela’s house. On many corners of the streets, I’d see people traveling on the trains asking for money or food, some houses had tin roofs, others only had cement covering their houses made of brick because they didn’t have money to finish their houses. As I entered the house, I was met with many family members and the smell of mold. I also enjoyed meeting my grandpa for the first time. When we walked up to his home, I was shocked by what I saw. His dear home was a small wooden building that had a tin roof that left many openings in the ceiling. The doors were not very strong and it made me worry for my grandpa’s safety. Yet, he never wanted to move from his home because it was the home he shared with my grandmother. Meeting him was one of the most special experiences I have ever had and, for the first time since moving, I was happy with our decision to move. However, this high didn’t last very long and the first one in our family to realize that their haste decision was not very wise was the person who wanted to return to Mexico so badly, my mom. My mom always hoped that they would get their papers so we could go live in Mexico, so when we saw her breakdown and cry about missing our home, it confused us. We thought she called Mexico her home, our home. It was as though she slowly remembered the reasons as to why they left the country in the first place. It is difficult to witness the person who always said that things would be alright admit that things weren’t going well. This caused all of us to think silently that we were wrong to leave. My sister was the next one that fell into depression. We would try to cheer her up by reminiscing the good memories we had but that would cause her to get angry at us for bringing it up. She would make it obvious that she blamed our parents, mostly our mom for I once followed her into our room as she pulled her covers over herself, while she cried and I told her I was willing to listen to her. I will never forget what she answered: “You don’t know what I’m going through, just leave me alone,” I remember just looking up at the chipped ceiling as I cried silently as I fell asleep. After that night I would sometimes keep my feelings and thoughts to myself because I felt like I would only bother my parents and my sister. I thought that, one day, we would be able to enjoy living in this small town, seeing we were going to be there for a long time. My first day of school was horrible. As I walked through the tall open gates of the enclosed elementary school, it felt as though I had just entered a prison, one that would cause me to slowly crumble. As we walked to the principal’s office, kids in grey-red and white uniforms stared at me in my blue jeans, a blue and pink flannel with my long black hair up in two heavy buns. I was most definitely an outsider to them. My mom talked to the principal and vice principal while I just watched the kids get in line before heading into their classes. I was soon left alone and the vice principal walked me to my new classroom. When he opened the door, he talked to the teacher. Afterwards he turned to the class and said, “Alumnos ella es Raquel Bravo y ella es de Gringolandia” (Students she is Raquel Bravo and she is from Gringo Land). They all stared at me again, I felt like running out of the door, but I just smiled and waved to them. The teacher showed me where my seat was and continued class. Many of the girls turned around, introduced themselves, and peppered me with questions that I struggled to understand. I tried to answer their questions as best as I could with my limited knowledge of spanish, hoping our conversations would blossom into friendships. When lunchtime began, they led me to the tables where students paid for lunch. One of the girls made it clear that she wanted me to be her best friend, her name was Ximena, she had the aura of someone who always wanted to be in the center of attention. Ximena was the one who kept asking me questions even after everyone got over the news of the new girl. For a while she was my best friend. I would follow her around like a lost puppy and agreed with her most of the time so I wouldn’t be a loner. Not feeling comfortable to reveal my true thoughts should have been an obvious sign of a toxic friendship to me. As the months passed Ximena went from my best friend to my worst enemy. I became friends with two other girls and a boy who had also lived in the United States. That’s when Ximena started to make fun of me. She would make fun of the way I talked and would yell hurtful comments in spanish and use the only cuss word she knew in english. She once tried to fight me physically. That was the only time I have ever gotten close to being in a physical fight with someone. It affected me in a because I used to see her as a friend, but she led me to believe that there was something wrong with me, that maybe I was the problem. I wish that was the only bad thing that happened to me that year, but it wasn’t. My grandfather, our reason for moving, was diagnosed with terminal lung cancer a few days before Christmas. Two weeks into the new year after eating his favorite ice cream and telling us that my grandmother was calling him to go with her, he died peacefully in his sleep. My mother felt so guilty for moving us so suddenly from our small hometown that she wanted to move us back to the U.S. and we were feeling happy for the first time in a while. There was a point where I was already in the States with some of my mom’s family waiting for my family to cross. It felt like we were so close to returning to my childhood town when my parents told me to go back to Mexico. I cried more than I originally did when we moved the first time, it was hard for me to go back to school in Mexico after our trip to Tijuana. I never really thought that after all the time I didn’t attend school, I wasn’t going to pass 6th grade but apparently I was able to do it. I was so happy to get out of that elementary school and never have to hear my classmates’ negative comments, I genuinely thought it was over. I was wrong because I was about to start middle school, which brought on some good and bad moments. 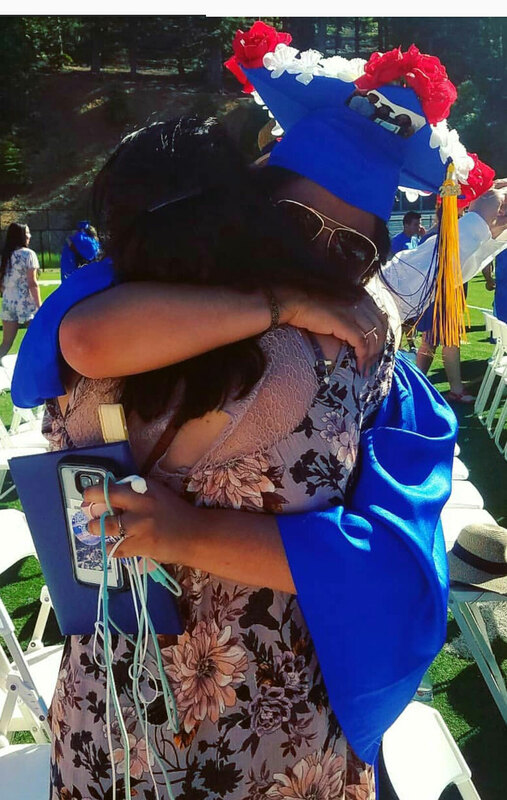 After spending years in Mexico as part of a mixed status family, Raquel Bravo finally graduates from South Tahoe High School on June 8, 2018, without the presence of her parents. Courtesy of Raquel Bravo. My parents decided that it would be in my best interest to attend a private school so I wouldn’t be bullied as much as I was in 6th grade. The first day of school was very awkward for me, I felt out of place even though I was wearing the same uniform everyone had. The majority of the kids in my class of 30 plus people had been in that private school since elementary. I only knew Lola, a girl that attended the same elementary school as I did, and we decided to stick together since we didn’t know anybody else. During lunch, this group of girls approached us and invited us into their group. Just by looking at the way the held themselves, you could tell that they thought very highly of themselves. Lola and I immediately said yes because we wanted to be apart of the popular crowd for once. It felt nice for awhile, we made more friends as time went on and we would all hang out under the stairs of the elementary wing during lunch. During class I really tried my best to keep my grades up, knowing that my parents were paying for me to go to this private school, to get an education when we didn’t have much money left. I wanted to turn invisible when teachers would have us read aloud to the class, since my spanish still wasn’t very good, and I didn’t want to give the boys in my class more reasons to bully me about the way I mispronounced words. Being apart of the popular group didn’t really help me escape from the constant bullying that I received from the boys, not even the girls that were supposedly my friends. Two months into the school year, our class was split into two separate groups, I took this as an opportunity to quietly leave the group of girls and hang out with another girl, Savannah, who had been a target of the “cool” girls. As time went on, my spanish slightly improved and I made two more friends, Ramona and Julia, cousins that arrived halfway through the school year. However, I was still struggling and going to school each day was a nightmare. Being in a classroom with less people meant that the teacher started calling on me more and more frequently. I would get really nervous causing me to mess up and the boy that sat next to me never missed an opportunity to make hurtful comments about me. There was one day where he just repeated my mistake out loud over and over again that I cried in the middle of class for the first and last time. As I buried my face into the old grey desk, I promised myself that I wouldn’t let their comments get to me and I would do my best academically to be in the top 10 students of the class. After that, many of the boys still made fun of me, but I ignored them and I focused on my studies. Sure enough, I was on my way to being at the top of my class, which caused many of my friends to frequently ask me to let them copy of my work, and I didn’t really mind thinking that they were my real friends. In my second year of middle school things really started to get worse. Savannah had moved away, Julia and Ramona started hanging out with the new girls in our class, ignoring me completely for a few months, and my family had hit rock bottom financially. My father had started his own business, but he wasn’t gaining many clients so the money that we had brought from the United States was the main source of money flow we had. Halfway through the year, the money we had in the bank was gone and we felt hopeless knowing that my father’s company was still struggling, and we had to pay tuition for my school every month. Seeing how we were struggling financially, I told my parents that I would stop going to school and I would get a job while taking online classes to finish my studies, like my sister was doing. My parents immediately shut that idea down, telling me that I should focus on my education and good grades so I could earn a scholarship, easing the financial burden. My parents have always told my sister and I that getting an education is important because when you have a bachelor’s degree, many door can be opened. The majority of my father’s siblings never really finished high school, and they struggled very much because of that. He would always say, “I want both of you to study a career you enjoy so it doesn’t feel like a job and you can take care of yourself financially without anybody’s help.” My parents never really pushed us to work once we were around the age when we could legally get jobs because they wanted us to focus on our studies. Knowing that they were sacrificing so much, it became my one goal in life to be able to get an amazing education without being a burden to my parents and I could one day take care of them like they had done for us. A few years later, I am now living in the United States of America finishing my high school education knowing I have better opportunities in order to finish my higher education without putting my parents in debt. Although it has been a difficult transition, I have been able to succeed in all of my classes with very good grades and for a while I was in the top 15 percent of my class. I believe my hard work has paid off since I was accepted into my university of choice and I have made my parents proud. One of the sacrifices I had to make in order to get a better education was to leave my family in Mexico when I was 15. Since then, I have been living with a family member who kindly opened her home to me. My parents and I call each other whenever we can, and many of these phone calls have ended with one or all of us in tears because we miss each other so much. However, we know that this was something I had to do, to better my education. And my family has never been more proud of me than they are now. Raquel Bravo is a senior at South Tahoe High School who wrote this as a part of her senior project. She is interested in becoming an editor and she plans to attend a U.C. in the fall.